California extends from latitude 32° 32' as its southern limit to the forty-second parallel, with its southern extremity lying between 114° 30' and 117° 6' longitude, and its northern extremity between 120° and 124° 15', giving it a northwest and southeast course along the coast of about seven hundred and fifty miles, with a breadth from one hundred and eighty to two hundred and eighty miles, comprising an area of 154,116 square miles. The State is bounded north by the State of Oregon, east and northeast by the State of Nevada, and the southern portion east by the Territory of Arizona, south by the Mexican Territory of Lower California, and west and southwest by the Pacific Ocean. Capital, Sacramento. Chief commercial city, San Francisco. The other principal towns are San Diego, San Bernardino, Los Angeles, Santa Barbara, Salinas, Monterey, Santa Cruz, San Jose, Oakland, Stockton, Vallejo, Petaluma, Napa, Santa Rosa, Eureka, Folsom, Grass Valley, Marysville, Colusa, Chico, Red Bluff, Yreka, and others thriving and growing into importance. The great cañon of Yosemite, the Big Trees of Mariposa and Calaveras, Lake Bigler, Donner Lake, Calistoga, the Geysers, the beach at Santa Cruz, and the numerous hot and medicinal springs in various parts of the State, are attractive summer resorts, visited, by large numbers of tourists from all quarters of the Union, seeking health and recreation. The distinguishing physical features are the towering Sierra Nevada on the east and the Coast Range of Mountains on the west, enclosing the broad valley of the Sacramento and the San Joaquin; the capacious bays of San Francisco, Monterey and San Diego, and the extensive waste of the Colorado Desert. Numerous subordinate ranges of mountains and lofty peaks are named, and smaller streams and valleys without number. In presenting the area of California, a comparison may be made with the section composing the Atlantic seaboard. The forty-second parallel, marking its northern limit, also marks the northern limit of Pennsylvania and Connecticut, and 32° 20', the latitude of San Diego, is south of the city of Charleston, in South Carolina, and the trend of the coast is about the same, but northeast instead of northwest. Our State, thus, would cover the principal portion of the Atlantic coast States of Pennsylvania, New Jersey, Delaware, Maryland, Virginia, North and South Carolina, and Georgia, the coast lines corresponding to each other, and the Sierra Nevada occupying the position of the Alleghany Mountains. The eastern coast presents numerous indentations in bays, rivers and sounds, while the western is broken only in very few places. With fewer harbors, however, the latter is subject to a less number of storms, and the dreaded Cape Hatteras has no counterpart on the Pacific. The prevalence of fogs in Summer and an occasional southeast storm at the beginning of the rainy season are all that render navigation dangerous, and notwithstanding the rigidity of the coast, secure landings are found almost at every point business or necessity demand. The natural harbors of California are the Bays of San Diego, Monterey, San Francisco and Humboldt, with roadsteads and landings at a score or more of places along the coast, safe at most seasons and at some localities, by the aid of the engineer could, without great expense, be made perfect. The Bay of San Diego, the most southern, is a small but completely landlocked sheet of water, the portion available for a harbor covering an area of about twenty-five square miles, and is of easy access, lies in latitude 32° 40', longitude 117° 12'. A deep channel connects it with the ocean and the bar at the mouth carries a depth of four to five fathoms of water, affording passage to the largest ships. The moan rise and fall of tides is 3.7 feet: of spring tides 5 foot, and of neap tides 2.3 foot. Here storms are of rare occurrence, and the climate is of the most equable and salubrious known. The towns of New and Old San Diego are at the eastern extremity of the bay. The steamers of the Pacific Mail S. S. Company call at this port, as well as do others, and it is the expected western terminus of the Texas Pacific Railway. Those arms of commerce connecting it with the interior and with the great cities of the world, give merited consequence to this, one of the most beautiful and safest harbors of the world. The anchorage of San Luis Key, in latitude 33° 17' and longitude 117° 29', is unprotected and little used. The same may be said of the anchorage of San Juan Capistrano, situated twenty-five miles northwest of the former. Anaheim Landing is equally unprotected, but in fair weather is considerably used, the receiving and discharging of passengers and cargo being effected by lighters while the sea-going vessels are anchored a mile or more from shore. Here the shore runs nearly east and west and the landing is distant from San Pedro between ten and eleven miles. Other and similar landings are made along the coast but cannot be designated as harbors. San Pedro Bay, though it cannot be classed with the bay of San Diego as a harbor, is the most important port of the lower coast. From it the productive country of the interior is easily accessible, roads leading easterly to Arizona, and northerly to the rich mining regions of Inyo, and those with the prosperous neighboring country give it a largo and increasing commerce. Los Angeles, twenty-two miles north from the anchorage, is the distributing point, but Wilmington, three miles inside the bar, is the receiving point. The construction, here, of a breakwater, or dyke, by the United States Government, running from a point of land called Rattlesnake Island to Dead Man's Island, has greatly improved the harbor, affording protection from the southeast winds, and at the same time so confining and directing the tidal currents as to wash and deepen the channel crossing the bar. This improvement is still in progress, and further dredging will give the harbor the safety and capacity that the importance of the position demands. Previously this was but an open roadstead with about five fathoms of water a mile from land, but it is believed a line harbor will be created where piers will be built, and landings made direct. At present lighters are used transferring freight through a tortuous channel to an inner bay at Wilmington. The tides rise and fall from three to five foot, with extremes of six and a half feet. Santa Monica is about twenty-two miles north northwest of San Pedro and fifteen miles a little south of west from Los Angeles, and fronts a largo open bay, or bight of the coast, lying between Point Vincent on the south, and Point Duma on the west, twenty-six miles apart. Here landings have been effected for a number of years, by means of lighters and surf boats directly upon the broad and smooth beach, but recently a wharf 2,700 feet in length has been constructed at which deep water vessels moor with safety. This adds greatly to the convenience of the commerce of Los Angeles. A railroad connects the two places, and is extending as the Los Angeles and Independence railroad to Inyo County. The Beach at Santa Monica is a favorite place for bathers, and the new town promises to become important as a summer resort as well as for its convenient harbor. Point Hueneme, or Conversion, is the next landing in much use as we go up the coast. A lighthouse has been proposed on this point which the Coast Survey locates in latitude 34° 08' north, and longitude to 119° 09' west. Westerly extends the Santa Barbara Channel, about one hundred miles in length and twenty-five in width, lying between the main land and the chain of islands, the principal of which are the Santa Cruz, Santa Rosa, and San Miguel. At the western extremity of the channel, on the land side, is Point Conception, one of the most prominent headlands of the coast, and protecting the southern section from the cold northwest winds which sweep, in summer, so fiercely along the exposed parts of Northern California and Oregon. The chains of islands along the Southern Coast, as San Clemente, Santa Catalina, San Nicholas, Anacapa, Santa Barbara, Santa Cruz, Santa Rosa and San Miguel are quite barren, and generally destitute of water, therefore offer slight inducements for culture, and with grazing capacities extremely limited. The most important is Santa Catalina, off the coast of San Pedro, which has a good harbor, but about all good fishing is found. Within the Santa Barbara Channel landings are made at numerous places, the principal being at San Buenaventura, Santa Barbara and El Coxo. These are generally open roadsteads, the swells of the sea being broken by a heavy growth of kelp, affording a partial protection to shipping and to wharves within. At Santa Barbara a substantial pier has been constructed which steamers and vessels approach and fasten to. From Point Conception the coast bears northwest, high, bold and dangerous. The first landing reached is that of San Luis Obispo, or Avila, as it is recently named, the principal town being ten miles inland. This is not a pleasant landing, though much used in obedience to the demands of business in the interior. The Bay of San Simeon, in latitude 35° 39' and longitude 121° 15', is an exposed roadstead, but affords a good anchorage during northwest winds. From this the shore stretches direct and unbroken to latitude 36° 35', where the small but beautiful Carmello Bay breaks the rigid line. The Sierra Santa Lucia rises abruptly from the sea, and from San Luis Obispo to Point Carmello, a distance of one hundred and ten miles, offers no depression for convenient passage, and is unexplored and unknown. A few miles north of Carmello Bay is Point Pinos, around which enters the grand and historic Bay of Monterey. This is the oldest of the occupied portions of California, having been entered and taken possession of by the Spanish, under Viscayno, in December, 1602. The bay is of large area, with an opening twenty-five miles broad, while it extends into the land only half that distance. The portion embraced in Point Pinos, being a capacious bay fronting the town of Monterey, is well landlocked, and constitutes a perfectly safe harbor. The Salinas and the Pajaro rivers enter the bay on the eastern side, their mouths forming good harbors for light-draft vessels. On the northern shore, near the ocean main, is the harbor of Santa Cruz, not always safe, but easily reached and much frequented. Thence northerly to the Golden Gate intervenes a rocky and dangerous coast. Several points project into the sea, and slight indentations are made, where light-draft vessels at times may land, but which larger ships always shun. Half Moon Bay, eighteen miles south of the Golden Gate, affords a good summer anchorage. Under the latitude 37° 48' longitude 122° 30', the coast abruptly opens to the great Bay of San Francisco, one of the very best harbors of the Pacific and of the world. 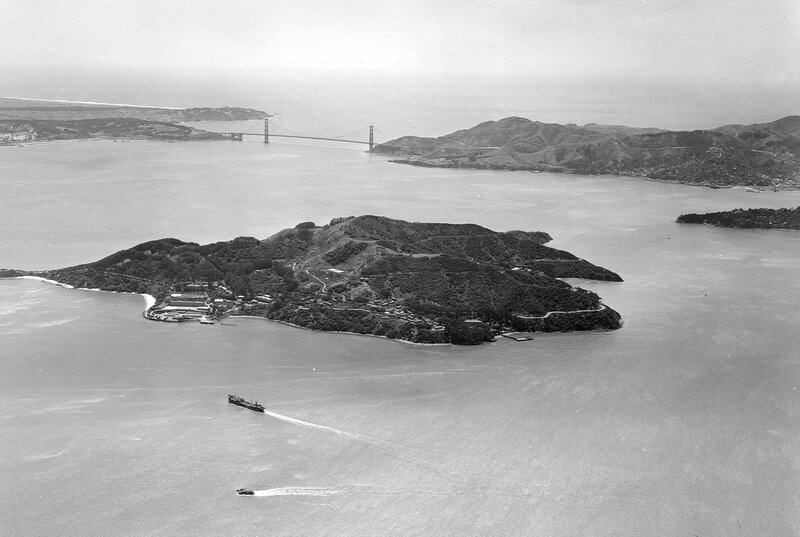 The entrance is by the Golden Gate, a strait one mile in width by six miles in length, expanding in the broad bay of eight miles in width, reaching southward forty miles and north twenty-five, and with Suisun adding thirty more to its extent, giving a shore line of over three hundred miles. This is a noble inland sea, containing a number of fine harbors, and possessing a commerce within itself. Upon rocky points defensive forts are erected; and Fort, Limo and Black Points, and Angel, and Alcatraz Islands stand in the passage-way, formidably armed and ready to dispute the entrance of a hostile fleet. The bar off the mouth of the Bay has a depth of five fathoms, rapidly deepening inside with an easy and safe passage. This bay, it is by some believed, was first entered by Sir Francis Drake in 1579, although general authority locates his bay and landing some thirty miles northwest. The entrance is otherwise reported as first seen by Forrelo, in 1543, the successor of the great Spanish Navigator, Cabrillo, but the only authentic account of the discovery of the bay was by a land party from San Diego in 1769, under Gasper de Partola, who were seeking the Bay of Monterey, but who, traveling eastward of the Coast Range, had missed the object of their search. In 1776 the Golden Gate was passed by Francisco Paulo and Benito Cambon and the Mission Dolores founded, and thence dates its opening and occupation." About the great bay are numerous estuaries and tidal inlets, as well as bold landing places constituting harbors of every class. The most notable are Oakland, Benicia, Vallejo and Sausalito. Oakland being at the terminus of the transcontinental railroad, and directly opposite the great city of San Francisco is most important. This city lies upon the broad estuary of San Antonio, upon which such improvements are making and ordered by Government as to make it one of the most convenient and best protected harbors in the world. Vallejo, although twenty-three miles distant from Golden Gate, is much used in freighting ships with wheat. Here is the Navy Yard of Mare Island, the chief naval station on the Pacific Coast. The other harbors and landings are so numerous that the whole Bay of San Francisco and its contiguous sheet of water, with their three or four hundred miles of shore line, may be regarded as one grand harbors. In this respect, with its central location, its contributory rivers, its surrounding country rich in agriculture and minerals, and the salubrity of its climate, render it the largest, best and most favored harbor of the globe. A few miles north of the entrance to San Francisco is Drake's Bay, more interesting from its historical associations than important as a shelter of commerce. Here the renowned navigator. Sir Francis Drake, landed in the summer of 1578, near three hundred years ago, and took possession of the country in the name of Elizabeth, the Virgin Queen of England. While here a monument was erected commemorative of the event, and engraved plate and coin deposited, but they have never been recovered. The Portuguese navigator, Cabrillo, under the orders of Mendoza, Viceroy of Mexico, had sailed along the coast in 1542, but Drake's is the first landing recorded, and the little bay, formed by the projection of Point Keyes, where it occurred, now bears his name. Tomales and Bodega Bays are parts of the same body of water, extending in the land immediately north of Point Reyes, and form one of the small class of harbors which are quite frequent along the northern coast. From Bodega Head the coast presents an even front to the ocean, without many rocks or points. Numerous small streams enter the sea, and at most of them are landings which are sometimes called harbors. Fort Ross, Havens, Point Arena, Novarro River, Cuffee's Cove, Albion River, Little River, Mendocino Bay, Russian Gulch, Gasper Creek and Noyo River, are the principal of these indifferent harbors. They are used chiefly by staunch sea-going schooners in transporting lumber and the products of the ranches to San Francisco. Many of these little harbors, however, are beautiful sheets of water when once inside, and their commerce, of the products of the country, is large and increasing. Under latitude 40° 25', longitude 124° 24' is Cape Mendocino, a prominently rocky headland, and the most western point of California. This was discovered by Cabrillo, in 1542, and named in honor of his patron, the Viceroy Mendoza, although the coast survey attribute the discovery to Ferrilo, the successor of Cabrillo, in 1543. Humboldt Bay, in latitude 40° 48', longitude 124° 12', is the most capacious inland body of water in the north, and furnishes an excellent harbor. The bar at the mouth has a depth of twenty-one feet at low tide, but the sea at times breaks dangerously upon it. The entrance to the bay is between two low sand spits, and is but about three hundred yards in width. This lovely body of water has a length of sixteen miles, and a breadth varying from one to five miles, constituting a noble, safe and beautiful harbor. Twenty-five miles north, Trinidad Point projects southwestwardly a short distance into the sea, and the small body of water contained in the curve is called Trinidad Bay. The point protects it from all but the south winds, and when these are not tempestuous the harbor is safe and good, it being claimed by some as the best harbor between San Francisco and Puget Sound. A short distance north, the great Klamath River pours its torrents into the ocean, but furnishes no harbor. Landings are effected during calm in the neighborhood, but the coast is not approachable in severe weather. The harbor of Crescent City, in latitude 41° 44', longitude 124° 11', is in part protected by Point St. George, and is safe unless in very severe storms from the south. At the extreme northern limit of the State is Pelican Bay, but a slight indentation of the coast, and without protection to make it a harbor of importance.